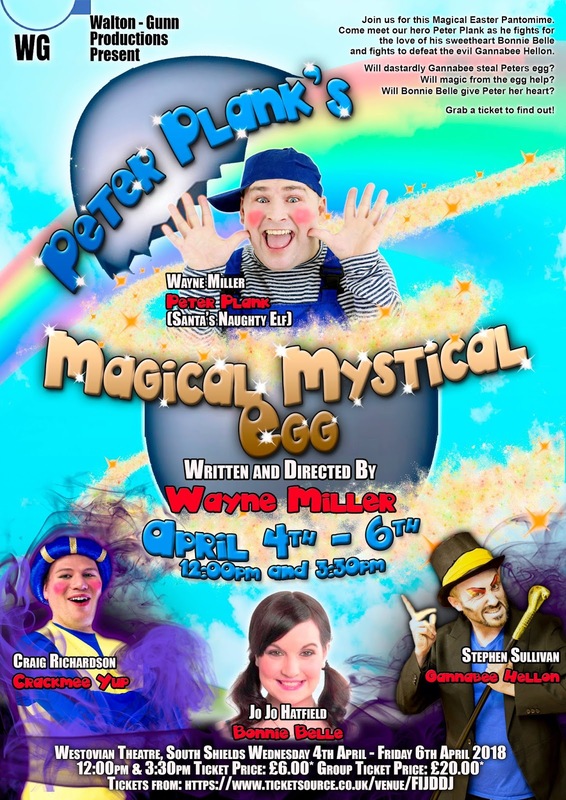 Peter Plank’s Magical Mystical Egg an Easter pantomime written by South Shields actor and writer Wayne Miller, has revealed its cast that will be bringing the laughs to the seaside town this April. Newly formed North East theatre company Walton-Gunn Productions announced earlier this year news of a production to open at The Westovian Theatre in South Shields this Easter. They promised to deliver well known and well-loved panto faces, and they have done just that. This cast has performed to thousands in the North East, with much audience and critical acclaim. Honours they are hoping to repeat in Peter Plank’s Magical Mystical Egg. Leading the charge as main character Peter Plank is the shows writer and creator Wayne Miller. A name known to many in for his performance as Santa’s Naughty Elf, a show that has been running at The Customs House Theatre in South Shields for ten years now. Playing Peters love interest the feisty Bonne Belle will be former Newcastle Tyne Theatre panto and musical star, as well as Capital Radio presenter, Jo Jo Hatfield. Bringing the mystical will be the star of last year’s Snow White at Newcastle’s NE6 Craig Richardson. A well-known face to both North and South Shields audiences, he takes on the role of CrackMee Yup. Finally, the one who will be guaranteed to bring the boo’s as villain Gannabee Hellon will be Stephen Sullivan. Stephen was last seen gaining praise for his evil turn in Newcastle’s Times Square Panto Jack & The Beanstalk. With such a stellar cast this Easter panto is hoping to wow its audiences, but also build up its reputation and become a tradition in the lovely seaside town. 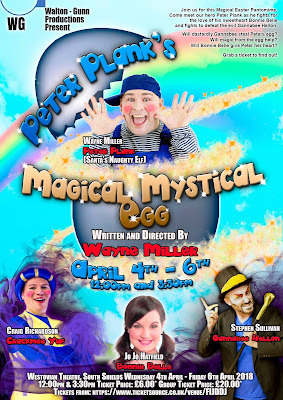 Peter Planks Magical Mystical Egg has been called a cross between Aladdin and The Greatest Showman. A tale of a magical egg that has the power to grant a wish, a wish that could make a dream come true for Peter Plank. A simple lad who only has one goal, he longs to be a great showman on stage…however life isn’t as simple as Peter! To find out if he gets his wish or the dastardly Gannabee Hellon gets in the way, grab your tickets now and find out for yourselves.